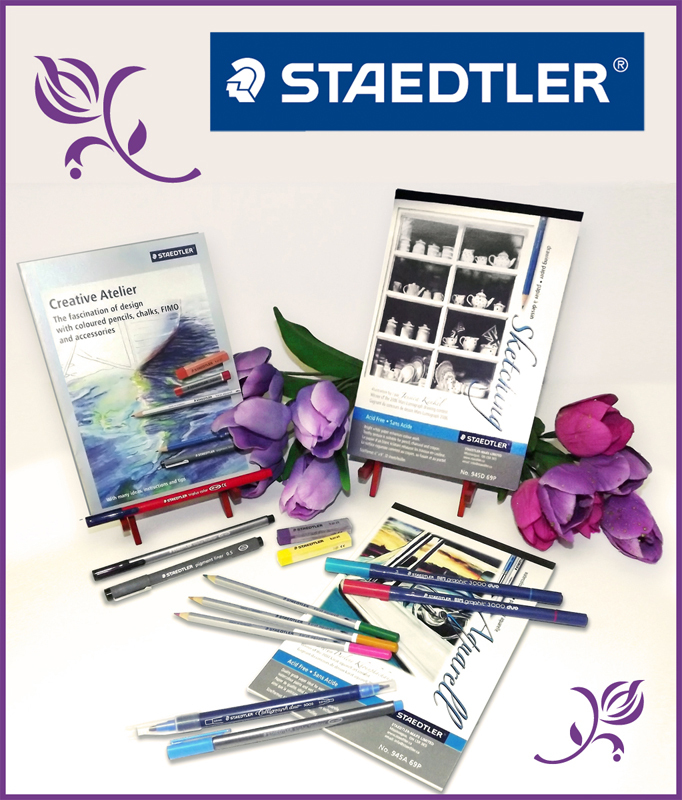 Have you ever wanted to try STAEDTLER products? Well I've got a treat for you! In celebration of Spring and Mother's Day, STAEDTLER has put together a wonderful assortment of products and each of the Design Team Members are giving away 2 Spring Sampler Sets! The STAEDTLER “Spring Sampler Set” contains the following: 2 Karat soft pastel chalk sticks, 2 Marsgraphic Duo brush markers, 3 Karat watercolor pencils, 2 triplus fineliners, 1 triplus color marker, 1 pigment liner sketch pen, 1 double-ended calligraphy marker, 1 watercolor pad, 1 sketch pad and a creative brochure (Note: product colors may vary). The retail value is $28! To enter, simply leave a comment on this blog post by May 11th. Winners will be picked using the Random Number Generator and posted here on my Blog on May 13th, so be sure to check back then to see if you've won! I would love to win this great package. 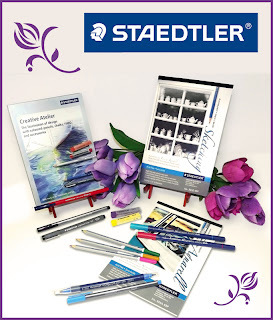 Staedtler is a great company and their products are top notch!!! Thanks for the opportunity to add these fine products to my stash of tools! Oh, what a fabulous set of creative goodies! what a nice give away. thanks for the chance to win. Wow! Would love to get my hands on these fabulous products! I declare ... you are reading my mind! I was just checking out this product and here you are giving one away! I sure hope I can be lucky enough to win this fabulous set! Thanks for the chance Lisa! Great give-a-way. Thanks for the chance. Wow this is a great give away. I have checked out this product many times but don't aways have the cash. Need other things. Thanks for the chance to win it. This looks like a fun assortment of coloring tools!! Would love to try them!! Thanks a bunch! i always like their products. I love that company's products. I'd love to be able to incorporate more into my art toolbox. Thanks for the opportunity! Love the pastel chalks and fineliner markers. If the Marsgraphic duo markers are this good then I'm in love. Looks like I could have a lot of creative fun with these products! Wow! This is a great give-away! Thanks for the opportunity! Wow! Thanks for a cance to sim these amazing art supplies! Thanks for a chance to win this special giveaway...Lovely blog...never have visited you before. I love Staedtler products, but they are so hard to find here in Norway, so thank you so much for this opportunity to win some great stuff!!! Would love to win this group of goodies. This is a fabulous set I would love to try out the tools that are shown here! wow, this is a great set. Would love to have the opportunity to create with it. What a great giveaway. I would love to use these products in my smash/junk journal. Thanks for the chance to win! This is an awesome give-away. Thanks for the chance to win. Would love to win. Thanks so much! I have never tried these, would really love to win. thanks for the chance! These look fun! Thanks for an opportunity to win such a generous prize! I've never had the opportunity to use these products but they sure do sound wonderful. What fun ... you can never go wrong with new art supplies. I would love a chance to win these products!